If you have ever misplaced you iPhone and could not find it for a long time time, you know the panic that immediately sets in. You start thinking all kind of things and start worrying as if your iPhone is lost forever. You start thinking about the information that you have stored in it, including the passwords, login details to your financial accounts, your Facebook account and much more. You start thinking about those pictures that you treasure and wish you had transferred them to your laptop before you misplaced your phone. 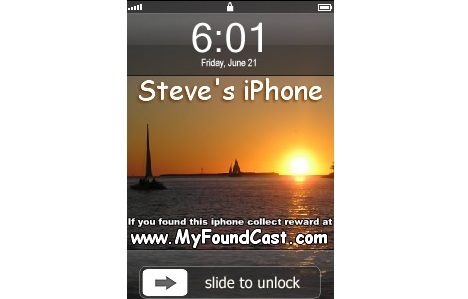 Imagine what will happen if your iPhone is ‘actually’ lost or stolen instead of just being misplaced. Don’t worry! The world is not about to end. There is still some hope for you if you have lost your iPhone or if your iPhone is stolen. Yes, the world of cell phone ownership has changed, and now you can not only protect your phone, you can also trace (remotely locate) your iPhone is its lost or stolen. First make sure that your iPhone is actually lost or stolen. To do this, simply make a call to your iPhone from any other mobile phone and make sure that you can’t find it. Once you are sure that your iPhone is stolen or lost, proceed further. First contact your mobile service provider to block the SIM of your iPhone. Then check the bill of your iPhone to find out its IMEI number, and contact your nearest police station to report the lost iPhone with its IMEI number. Use this police report (its is called FIR, or First Information Report in India) to contact your mobile service provider. They will first block this iPhone so that it becomes unusable for the person who found or stole it. It will not work even if they change the SIM. Then they will help you trace your iPhone using its IMEI number. You don’t have to go through all this hassle if you have any one of the following iPhone tracing and tracking apps installed on your iPhone. So, if you find your iPhone using the above procedure or if you buy a new iPhone, the first thing to do is to install any one or more of these apps. 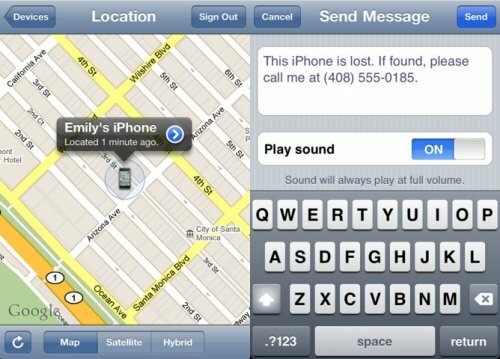 • Find My iPhone: Assuming that you have iOS 5 on your iPhone and you have an Apple ID and you have already installed the Find My iPhone on your iPhone, and Allowed it from ‘Settings > iCloud > Find My iPhone’. Go to https://www.icloud.com/#find and login with your Apple ID. Click on Find My iPhone button and the app will instantly trace your iPhone to its exact location on a Map if its currently connected to the internet. If the iPhone is not connected to the internet, you can enable the option in Find My iPhone app to email you its location on map as soon as it gets online. If you click on the location point of iPhone on the map, the Find My iPhone app will offer you three choices. You can play a sound on your iPhone or send a text message, you can wipe all your personal data on iPhone and you can lock the iPhone. First you should send the message on your iPhone asking the new owner(?) to send the iPhone back. You may also consider offering an award if they do send it back to you. You should then lock the iPhone after some time. If you get no response even after a long time, you may consider removing all your data on it and then try to track it down via GPS locations on the map. Note that once you wipe the data on your iPhone, it will be reset to factory defaults, and it will be impossible to recover the data on this iPhone even if you find it later. 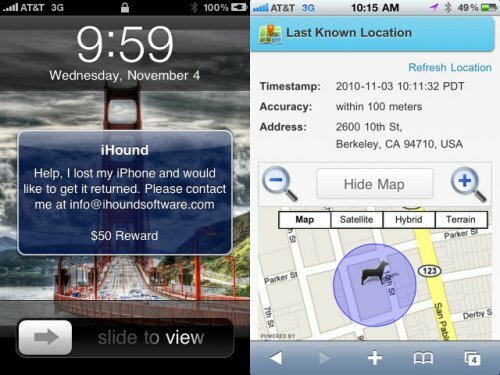 • iHound: If you have an account at iHound, and have installed their iPhone tracking app, it will send you an alert by email stating that your iPhone is being located, whenever someone else connects your iPhone to their computer. You will also receive a report that shows where your iPhone is being used when you log into the website for iHound. This is an important app to install as anyone who has stolen or found your lost iPhone will connect it to his computer to install and modify the iPhone for his own use. • Navizon: This app uses GPS navigation, WiFi and Cellular triangulations to zone in on where the lost iPhone is located. Within this app is a newly added option that allows iPhone owners to send a text message to their iPhone to help track it. • Mobile Spying Apps: There are some mobile spying apps like Mobile Spy and Phone Sheriff that lets you spy on any iPhone. These type of apps are generally used by parents to track the actions, including messages and phone calls, of their children. If you are young, you can ask your parents if they have any iPhone spying apps installed on your iPhone because these apps can help you track the exact location of your iPhone on a map. I know you will hate your parents after this, but hey, you at least got your lost iPhone back. As you may have realized by now, the best solution to find your lost or stolen iPhone is prevention. It is best to already have security and protection apps installed and actively working on your iPhone, just in case you do lose or misplace it. This way, you will not get a panic attack or hours and hours of worry when your iPhone is suddenly gone. With security and protection apps like the ones listed above, you will at least know how to attempt to recover your iPhone if its lost or stolen. Note that some of the iPhone tracing and tracking apps listed above may need jailbreaking of your iPhone. Please make sure you understand what you are doing before you jailbreak your iPhone. HackTrix will not be responsible for any issues that may arise with your iPhone if you jailbreak it to install the above apps on it. Update: Here’s how you can trace, track and find your lost Android phone.